Pep Guardiola has told Raheem Sterling he wants to keep the England winger at Manchester City as his contract saga drags on. 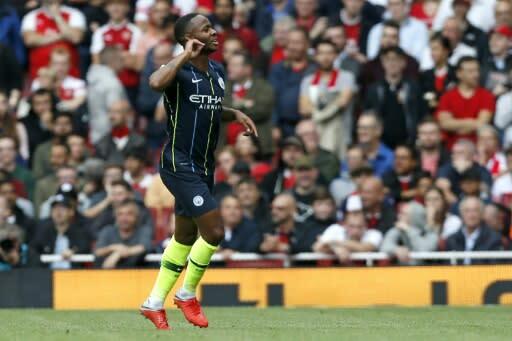 Sterling bagged his 50th Premier League goal on Sunday with a cool first half strike as the champions marked the start of the Premier League season with a 2-0 win at Arsenal. The 23-year-old has two years left to run on the five-year deal he signed when he moved to City from Liverpool in July 2015. But Sterling and his club are yet to agree an extension amid reports he wants in the region of �300,000-a-week to remain at Eastlands. That would make Sterling one of the highest paid players in the Premier League, but Guardiola insists his player is highly valued at City regardless of the contract impasse. "We are delighted with him and would like Raheem to stay," Guardiola said. "We'll do our effort to make him feel we count on him. And we count on him. "We arrived after a difficult season and I told him I want to help him and would like him to be happy. "In the end, the agents may not have agreements and that may not happen. "But he knows and his agent knows we like him and want him a lot." On Sterling's quick return to the City line-up following his post-World Cup holiday, Guardiola said: "His mum and dad gave him a special body shape. "He's small, tiny, so these kind of guys in one week are ready. He was good in training. "We needed that guy in that position, and he did it well except the last 25 minutes when he was very tired." Sterling's finishing with England has been under the microscope in the past -- it is almost three years since he scored for his country -- and he marked his goal with a cupped ear celebration aimed at the critics. "There's been a lot of talking...it's just one of those things I get judged on. I've got to keep improving and getting more goals," Sterling said. Guardiola defended Sterling's goalscoring record, saying: "If you judge the players in the World Cup if they score a goal or not. Raheem had this 'special' relationship with English football, but he's so loved in the locker room. "He made some very good things in the World Cup, how he moved and created space for others. "He likes to score goals and he tried, but I'm sure in the European qualifiers he will score goals for his country, England."